In Florida you need to pass 2 state issued exams. The training you need is available from over 40 vocational schools that are accredited in Florida. Because of the convenience we recommend that you enroll in a live campus based program. Most of the schools offer anywhere between a 1 to 2 year program. For your course work most schools offer a complete program ranging from 1000 to 1300 clock hours in length. The courses that you’ll take cover topics such as: electrical, air conditioning components, calculations, blueprints and heating technology. A typical HVAC program will cost between $2500 to $10,000. Some courses might be less but make sure before you enroll that they will properly teach you what is required so you can pass your Florida HVAC license. Additional information can be found at the Department of Business and Professional Regulation which is a division of the Florida Construction Industry Licensing Board. Once you finish with your courses and earn your diploma from an accredited FL school you can then apply for your state exams. Instructors – Make sure your school hires qualified AC/HVAC professionals that have once held a Florida HVAC license and worked in the field. Courses – You’ll cover topics including: pre installation, equipment components and maintenance, safety, accounting, government regulations, pipe configurations, storage tanks, valves and ductwork and fuel heating systems. Some schools teach you courses for your EPA certification which is a national certification. Technology – When looking at the program the school has to offer find out what type of equipment they teach on. It is important that you study at a facility that is going to teach you about all the latest in equipment as well as units. Also what type of study materials do they have? Most will give you standard textbooks but also should include DVD’s, flashcards and practice exams that will prepare you for the state exam. Financial Aid – Many of the school will offer special financing as well as federal financial aid to help you pay for your education. Job Placement – Talk to the school to see what connections they have within the HVAC industry in Florida to help you find employment after you graduate. You must have 4 years of experience in the trade or 1 year of being supervised OR a 4 year degree from an accredited Florida college within 1 year of experience. Class A License – With a Class A you can work on, maintain and repair AC and heating units. The licensing exam costs will cost $355 and the renewal fee is $125. Class B License – If you have a Class B license you will be limited to working on units that are 25 tons or less in size. Once you earn your FL HVAC license you’ll have reciprocity with North Carolina, California and Georgia. - You need 14 hours of CE courses to keep your license valid. - The FL state exam is made up of 2 sections and requires you to have a passing rate of 70%. - You will need to pass a completely separate exam by the EPA if you are going to be working on ozone depleting units. - Positions you will qualify for include: HVAC Technician Assistant, Installer as well as Entry Level Assistant. HVAC jobs are expected to increase 34% according to the BLS and over 18,000 of the total jobs are in Florida. The average salary is $41,000 but one can earn more with additional certifications as well as owning and operating your own business. You will need to carry insurance including $100K bodily injury and property damage. HVAC technicians in Florida are trade professionals who specialize in the field of heating, ventilation, and air conditioning service. 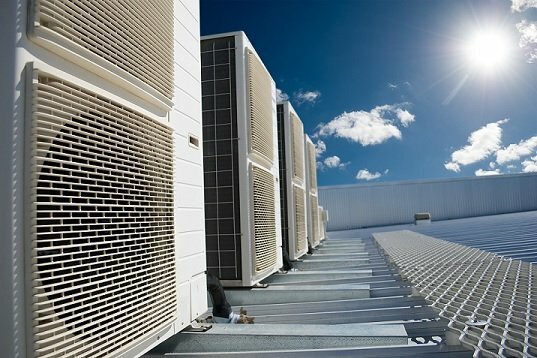 They can install, repair, and maintain systems that control the climate in all types of residential, commercial, and industrial buildings. HVACR technicians are trained to work on refrigeration systems, in addition to heating, air, and ventilation systems. As a HVAC tech, you would be responsible for reading blueprints and determining the most effective way to wire units, run duct work, install systems in residential and commercial buildings, and troubleshoot units that are not working. Doing these things includes conducting proper tests to ensure that all systems are operating properly and efficiently. Repairing, diagnostics, and troubleshooting systems is one of the major responsibilities HVAC technicians see in their daily jobs. Often, duct work becomes worn out or falls into disrepair. Heating and air conditioning units stop working or don’t work as well as they should. HVAC techs visit the client’s location to help determine the cause of any issues. As a tech you would be expected to inspect and address the concerns while diagnosing the problem and providing the best solution. There are proper procedures to follow to ensure that the work is up to state code. Additionally, many HVAC companies prefer one brand of products to another. So, it’s important that you know which parts can be switched out with other brands so that future problems don’t arise. If you become an HVAC technician in Florida, you will be an important asset in maintaining and creating habitable living and work conditions. Installing and repairing HVAC systems that provide better quality of air, temperature, and that help control humidity will provide comfortable environments for other Florida residents. For those who gain the refrigeration license, you’ll also be able to help people keep their food and medicine at the proper temperatures. HVAC techs help Florida residents enjoy a high quality of daily living. The job of an HVAC tech is physically demanding. It requires physical strength to handle the heavy equipment involved with installing systems. Manual dexterity is needed to assemble key components to ensure the system operates correctly and to help repair broken units. HVAC techs also need patience and customer service skills. Why Become An HVAC Technician in Florida? Florida has the highest employment level of HVAC/R technicians in the United States, according to the Bureau of Labor Statistics. You do not need a four-year bachelor degree, making it an affordable career option and an alternative to an engineering degree. It is a rapidly-growing field with great demand with many job opportunities. After finishing your education and passing state mandated tests, you could either work for an established HVAC company or you could start your own. HVAC technicians in Florida mostly work in homes, schools, hospitals, office buildings, and factories. They work indoors and outdoors, depending on the system setups and needs for the jobsite. They work varied hours depending on the season and assigned shift. Work is often full-time. Peak seasons will see an increase in job demand and hours needed to work. There are some risks faced such as electrocution, muscle strains, or burns. Following proper safety guidelines will reduce any risks faced. It’s important to note that HVAC technicians often work in environments where the temperature is not regulated. So, it’s important that HVAC technicians are able to tolerate extremes in temperature. The Bureau of Labor Statistics reports that between 2014 and 2024 the industry is projected to see a 14% increase of employment. This rate is much faster than average increases in similar fields. By 2024, Florida is projected to see employment in this field increase by almost 40,000 jobs. Candidates with fair knowledge of computers and troubleshooting skills should not have any difficulty in finding work. Growth in the industry is fueled by old and new construction of commercial and residential buildings. Many older buildings and homes being remodeled may not have had HVAC systems when they were originally built. Remodelers choose to update or add-in systems to enhance the living environment of the house or building. New constructions projects provide jobs as areas continue to grow. Systems need to be replaced after 10 or 15 years, or sooner if there is damage from hurricanes or vandalism. According to the Bureau of Labor Statistics the median pay is $45,110 per year and $21.69 per hour in 2015. Experienced HVAC technicians in Florida naturally earn more than an apprentices. As skills improve, pay tends to go up in this field. HVAC technicians are not required to have a license in the State of Florida. However, HVAC Contractors are required to have a license in order to bid on any projects within the state. Two exams are required in order to receive a license. So, if you plan to start your own business, you will definitely need to sit for both exams. You’ll learn more about what you need to apply for your state license below. However, if you plan to handle refrigerant, you will need an EPA certification. High school Graduates or GED Equivalent candidates can gain proper instruction in heating, ventilation, air conditioning, and refrigeration programs. Programs can last from six months to 2 years. Apprenticeship programs are another option. Most apprenticeships last from three to five years. Potential trainees must be at least 18 years of age, possess a valid driver’s license, and past a basic math test. Screenings for substance abuse may also be required. The Department of Business and Professional Regulation requires all applicants to undergo criminal background checks. Applicants can undergo fingerprinting at a state approved Live Scan center in Florida. The Florida Academy is accredited by the Council on Occupational Education (COE) as well as North American Technician Excellence and Research. Their programs are very affordable and respected in the industry and offers you a Fast-Track option to get you in the workforce as quickly as possible. You will also be given assistance so you can earn your EPA Universal Certification. This certification is something that most employers want to see on your resume. The school is located at 4387 Colonial Blvd, Fort Myers, FL 33966. They currently have a A+ BBB Accredited Business rating. Earn your HVAC/R and PLC diploma from Florida Technical College. The PLC or (programmable logic controller) makes the program at FTC different than other HVAC/R programs. The program offered takes approx. 17 months to complete. You’ll study applied mathematics, digital electronics, domestic refrigeration and A/C, learn about codes and regulation as well as heat pumps. FTC offers their HVAC programs at the following campus locations: 1199 South Woodland Blvd. Deland, Florida 32720, 12900 Challenger Parkway Orlando, FL 32826, 3831 West Vine Street Kissimmee, Florida 34741 and at 12520 Pines Blvd. Pembroke Pines, FL 33027. Earn your HVAC certificate from Palm Beach State College. Their program lasts for 13 months and classes fill up quickly. They currently offer a full-time program but not in the evening. You will need to take the TABE exam but you can get an exemption if you have taken the ACT, SAT or CPT exam with a college level score. The school is located at 4200 Congress Avenue Lake Worth, FL 33461. Besides the abundance of jobs that are found in Florida when doing a simple search we also found a wide variety of HVAC service technician jobs in industries we never even considered. One that stood out was a refrigeration technician at a Coca Cola plant in Tampa, FL. What was so amazing was they only required 1 year of experience where many of the jobs we found were between 2-4 depending on the salary they were offering. Also instead of doing the actual duties of an HVAC/R technician many career opportunities that we found were as maintenance supervisors where you’ll work in a team and even at the state or federal level. These positions however we noticed paid less (20% on average) than just becoming your own HVAC technician or working for a company that offers these services. Some of the hottest spots were in: Tampa, Miami, Coral Springs, Jacksonville, Riviera Beach, Sanford, Alachua and Tallahassee.